from my home to yours! To put off doing something, especially out of habitual carelessness or laziness. To postpone or delay needlessly. It happens every year without fail. and every year I find myself way behind. The party is Saturday night. We're expecting about 80 people. A couple of the rooms are decorated. I'm blogging instead of finishing up. I like to say I work better under pressure. My kids say that's giving myself too much credit. They say I'm a procrastinator. I say, I'll think about that later. The Kramer Angle is in three locations! I've been racking up the miles on the Honda Odyssey and shoving as much furniture as I can in the back in my quest to fill my shops. Which has made my husband, oh, a tad cranky! So, a few months ago I found myself daydreaming about buying a pickup truck like this one. 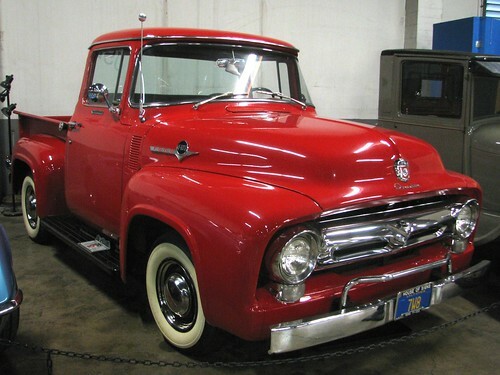 I love the whitewalls, the candy apple red finish and could definitely see myself hauling my industrial chic finds back to the barn in this beauty! But they're not exactly easy to come by, not to mention easy on the checkbook. So, instead I set my sights on another truck. It belongs to my absolute favorite brother-in-law in the entire world! Who also happens to read my blog! Cool, calm and collected and always on the cutting edge of technology. He likes the good things in life. 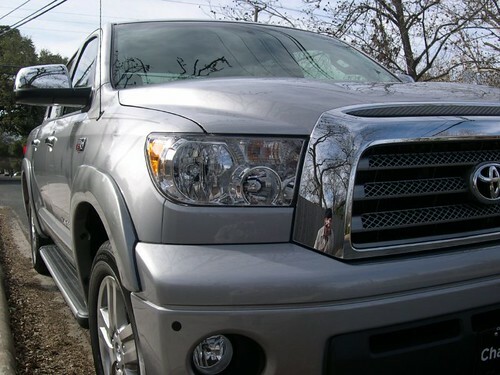 So, I hinted around, I pleaded, I begged, I appealed to his ego in an effort to get him sell me his truck. a suave, sophisticated, smart man like himself should be driving a more current model truck. A 2008 is so beneath him. But, he didn't buy it. The truck is still in his garage. Defeated and disappointed I set out to find a truck that would suit my needs. Now all I need to do is find some of those hitch hanging bull testicles and a gunrack for the cab and I'll be all set! Let me know if you want to ride shotgun! Sometimes best intentions go awry. Take my intention to post photos of what I picked up in Florida on my buying trip. When I promised to post photos of the incredible industrial lighting, stools, baskets, and salvaged porch spindles-turned-lamps? Ahh, so you do remember! I haven't gotten around to it yet! This one's close to home. We've decked the barn with tons of antiques, architectural salvage, vintage accessories, and holiday decor! Check it out here for some sneak peeks at what you'll find at this weekend's show. Like custom burlap table runners with ruffled trim! Stop by and say hello, I'd love to see you! Another Barn exclusive - burlap stockings. You're going to love this lamp! A custom made French linen lampshade with opalesque buttons topping a salvaged porch balustrade repurposed into a lamp! Beautiful ornaments and a sneak peek at one of those custom burlap and duckcloth runners I was talking about!